The material that follows is meant to serve as a brief review of neuroanatomy relative to swallowing to renew our clinical knowledge and skills. It is not intended to serve as an exhaustive description of neuroanatomy. During our initial consult or clinical swallowing evaluation, many of us routinely perform an oral mechanism examination before proceeding to administer test boluses. We assess and treat swallowing function; however, we also evaluate swallowing function relative to its neurological underpinnings. As we ask a child to close her lips, we are evaluating labial seal in light of anterior bolus containment and production of labial speech sounds. However, we are also cognitive of the fact that lip seal is largely innervated by the Facial Cranial Nerve (CN, V). Thus, this article serves to review basic Neuro-anatomy relative to swallowing. Swallowing occurs reflexively at a brainstem level. We know this through animal studies that have decerebrated cats where the cats continued to swallow . However, we also know that swallowing receives cortical influences. That is, cell bodies of neurons originate in the motor strip (pre-central gyrus). Their axons course inferi- orly through the internal capsule of the brain and synapse at other cell bodies of neurons in the brainstem. These axons emerge from the brainstem and innervate the muscles utilized in speech and swallowing. The first cell body (originating in the cortex) and its axon is known as the upper motor neuron. The lower cell body (originating in the brainstem) and its axon is known as the lower motor neuron, final common pathway, or cranial nerve. Swallowing is a motor or efferent process but equally important is the role of the sensory or afferent limb. Oral and pharyngeal mucosal receptors “feel” the bolus and signal the brain as to the size, viscosity, taste, and temperature of the bolus. All of these bolus properties have been demonstrated to change the timing of swallowing physiology. Thus, this afferent process or the sensory part of the swallow is every bit as important as the actual swallow itself. I think it is easy to fall in the pattern of only evaluating and treating the motor part of the swallow while neglecting the sensory portion. That is, we tend to overlook how important it is that the brain receive the appropriate information as to the properties of the bolus so that it may generate an appropriate motor response. If the brain doesn’t work correctly on the sensory end, it is highly unlikely it will work efficiently on the motor end. Sensory pathways typically involve three major neurons. The first neuron (axon and its cell body) incorporates the receptor that “feels” the bolus and courses towards the central nervous system. This first neuron synapses with the second major neuron which is located in the spinal cord or brainstem. The second neuron projects its axon superiorly to the thalamus which begins processing the sensory information obtained. The third neuron projects its axon superiorly to the sensory cortex. Both the motor and sensory pathways just described have been simplified; however, one can appreciate how a lesion to the cortex or brainstem can affect the ability to receive the appropriate sensory information and therefore execute delayed or weakened motor responses with swallowing. At just the brainstem level, the major nuclei (compilation of neurons) involved in sensory functions is the nucleus solitarius. That is, the nucleus solitarius is a collection of neurons that receives the sensory information of bolus size, bolus viscosity, etc. The nucleus solitarius takes this information and sends it (via axons) up to the thalamus and sensory areas of the cortex. The nucleus solitarius also projects axons to other areas of the brainstem such as the nucleus ambiguous. 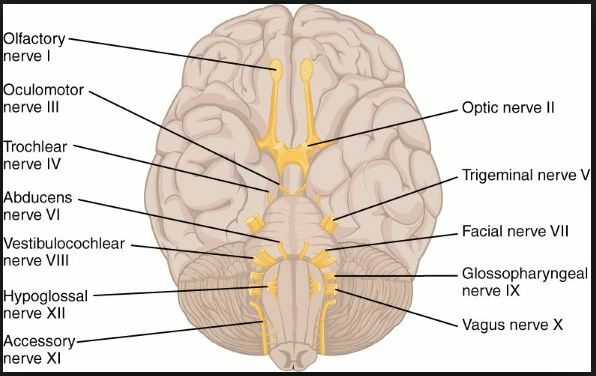 The nucleus ambiguous is a major nuclei of the brainstem that is involved in sending out motor commands to initiate swallowing. Since the nucleus ambiguous is part of the motor aspect of swallowing, it receives projections of neurons that originate at the motor strip of the cortex and project downward to the brainstem. The nucleus ambiguous also receives information directly from the nucleus solitarius. The neurons in the nucleus ambiguous are part of lower motor neurons. That is, the cell body found in the nucleus ambiguous projects its axon to the muscle that needs to be contracted for swallowing.